Description: Annual herb with twining or decumbent stems to 100 cm long, minutely pubescent or slightly mealy. Leaves acuminate, broadly sagittate-cordate, 2–6 cm long, 1.3–3 cm wide, margins entire or sinuate-crenate. Flowers in small clusters spread along branchesp; perianth segments greenish white, narrowly keeled or narrowly winged near apex. Achene 4–5 mm long, dull, black, with a finely granular surface. Distribution and occurrence: Widespread weed in NSW; also in Qld (Atherton Tableland and SE Qld), Vic, Tas, SA, WA. Native of temperate Europe and western Asia; a widespread weed in other regions. Other Australian states: *Qld *Vic. *W.A. Tas. *S.A. Seeds cause enteritis in stock. 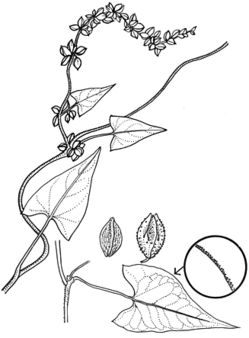 Its persistence and spread is aided by seed dormancy over several years (Metzger 1992). Often confused with the native Muehlenbeckia gracillima but readily distinguished by its trigonous nut, finely scabrous but not strongly crisped or undulate leaf margins, and only shortly divided perianth segments.